The day is ending, night is falling, and Nicholas’s cat won’t come down. High on the roof she licks her paws while Nicholas worries about her up there all alone. How does he coax her into the safe, warm house? She doesn’t even want to come down from the roof… or does she? Click here to read more about Lucia Masciullo. Don’t Let a Spoonbill in the Kitchen! Sonya Hartnett was born on 23 March 1968 in Box Hill, Victoria. She is an Australian author of fiction for adults, young adults, and children who has published many novels to international acclaim. In 2008 Sonya was the recipient of the prestigious Astrid Lindgren Memorial Award. The prize is awarded to authors, illustrators, narrators and/or promoters of reading whose work reflects the spirit of Astrid Lindgren. It is the first time this award has gone to an Australian. Born and bred in Italy, Lucia Masciullo now lives on the Gold Coast, where she works as an illustrator. She defines herself as a ‘visual explorer’ and while she works traditionally, her dynamic compositions and whimsical characters give her illustrations a fresh, contemporary feel. She likes running, surfing and eating homemade pizza. 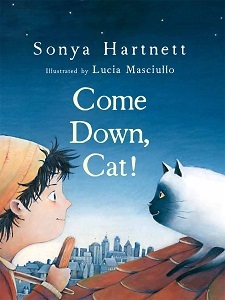 She has illustrated Sonya Hartnett’s picture books The Boy and the Toy; Come Down, Cat! and The Wild One and Kim Kane’s Family Forest. Visit her online at www.luciamasciullo.com.